March 2015 saw the 30th anniversary of the return to work of the striking miners of 1984/1985. If like me, you live in Barnsley, you would have already been only too well aware of this – not just because of the plethora of wonderful exhibitions, gigs, talks and plays which marked the year long struggle, but because it runs through the veins of this town and made us what we are today. One man who will make sure we never forget this is activist Tony Wright, from the self-proclaimed ‘proper socialist punk band’ The Hurriers. As well as the music they write and the benefit concerts they organises, to mark the 30 years since the return to work, he has put together this stunning collection of radical song and spoken word. As is expected, there is a smattering of Barnsley acts – and why not, we were at the epicentre – who sit alongside a handful of premier leaguers who add a little gravitas to the ceremony, such as Paul Heaton, Billy Bragg, Sleaford Mods, New Model Army and Chumbawumba. The rest of the line-up reads like a who’s who of the radical left-wing music scene of the UK. Louderthanwar.com has already called this “surely one of the most important political protest albums of recent times”. Its thirty-three tracks mean that a concise review would bore even the most hardened reader, so here I’m just going to mentioned those songs that resonate with me the most. As with most compilations, it’s a real mixed bag. Wakefield’s Louise Distras has her tremendous raw voice and acoustic guitar bulked out with the beautiful sounds of a Hammond organ on Bullets and Billy Bragg lends a voice of authority to the album with Which Side Are You On?, a song written in 1931 by Florence Reece, the wife of Sam Reece, a union organizer for the United Mine Workers in Harlan County, Kentucky. The song has been covered and rearranged many times, but Bragg’s version from his ’87 Back to Basics, was recorded specifically with the miner’s strike in mind. I’m unfamiliar with Blossoms, but their song Blow reminds me of a couple of psychedelia-tinged bands from my own town; specifically The Glavins. Really like those backing vocals. And vocalist Chris, from Barnsley’s Wilde Sammon, sounds gruffer than he usually does on their almost wild-west sounding offering, Remember Orgreave. Thee Faction, Cambodia and The Opressed up the tempo drastically. Thee Faction bring the brass and the brawl, Cambodia bring eloquent yet old-school fist pumping anger and The Opressed bring some Oi! Oi! Oi! to the fight. All three offer songs that will have you dancing as well have marching. A few of the acts really change the tone of this set drastically. The Black Lamps, already one of my favourite bands, add something entirely different to the mix with their Bunnymen/New Order-esque beats and uplifting vocals. New Model Army’s fuzz-heavy guitar hints at doom in both the musical and lyrical sense. Their Angry Planet reminds me of Monster Magnet, and also makes me want to rediscover the ‘Army’ after an ignorant few years away from them. Spoken word plays a big part on Orgreave Justice. Pitman Poet’s sharpe words are like an index finger being pressing upon your forehead – he’s knows what’s what, drilling it in with rhythm. Attila The Stockbroker’s Never Forget is stark and uncompromising in its tale of communities coming together to fight the fight. Sleaford Mods is an act that’s always divided me. Their tinny laptop beats have never clicked with me but Jason Williamson’s lyrics and presence get me every time. Here Guillotine is no different, in your face, mucky and speaking the truth. The acoustic singer songwriter plays a big part here too, as they do on the left-wing music scene. Many of them offer something unique. Quite Loner’s live version of Kneel and Comply utilises lush mandolin and whistle to lift it above the standard one-man-and-his-guitar fare. As does Joe Solo’s No Pasaran with its mournful violin. Grace Petrie is a stand-out. She has a wonderful tone on her song Rise. Backed by just subtle acoustic guitar and an almost tribal drum beat, she’s another one to watch. You also have a cappella songs too. Chris T-T’s If You Want To See The Minister is sung with no music to the tune of a traditional song and is often as funny as it is true, and questions why we are in the situation we’re in now and who is to blame. Coal Not Dole is a song I’m very familiar with, after hearing renditions sung over the years at Barnsley Folk Club. Here it is sung a cappella by Chumbawumba and is reminiscent of The Watersons and a real highlight for me; written by striking miner’s wife Kay Sutcliffe during the strike, this song will one day be considered ‘traditional’ (and already is to many). Another highlight is Paul Heaton’s contribution. I’ve not listened to him for a long time, so this was an unexpected treat. His voice never ages and is a real comfort. His song Acid Country is a song about multi-cultural Britain (Bombay Mix and Chinese Chips), and over its eight minutes it builds and builds upon its layers of acoustic guitar, ooompa-pa brass and even a choir! Fantastic, and another one I’m going to have to explore more to later. However, for me, the real beating heart of this compilation lay amongst two tracks. First, The Christmas of ’84 by Jethro Platts. This spoke-word piece written from a child’s perceptive is backed by the soft guitar of Del Scott Miller, and as Jethro whispers into your ear, he plays the part of both miner and son. It is tender and strong, sad and optmistic. His voice is friendly and authoritative, and if you know Jethro like some of us Barnsley folk do, you’ll know that’s him. His words are insightful and heartbreaking, and a real reflection of a family’s experience of the miner’s strike of 1984. Second is the almighty Truth And Justice by Barnsley’s The Hurriers. Polished indie production, a real knack for writing a damn catchy song a la The Jam and a seething rant about South Yorkshire Police’s tactics at Orgreave close this album in proper style. The packaging for this album is just wonderful. It’s quite obvious that a lot of love has gone into it, whether it be Tony Wright or the designers. That final touch is the wonderful photographs f the strikes by John Harris. It makes me proud to think that Barnsley folk are producing works of this quality but also one of them went and put this compilation together in the first place. If you are into punk, folk or poetry, then this should be an essential part of your music collection. 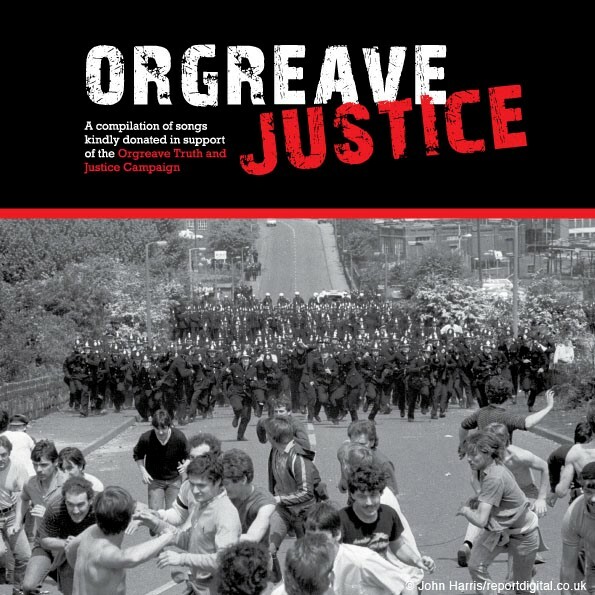 The Orgreave Justice CD is available now for just £9.99 with all profits going to the Orgreave Truth and Justice Campaign. The album is also available in a t-shirt bundle. If you’re close to Barnsley, you can also buy the album from Debut Records or Vinyl Underground. The Orgreave Truth and Justice Campaign includes ex-miners, Trades Unionists, activists and others who are determined to get justice for miners who were victims of police lies and cover ups at Orgreave in June 1984. You can also find more information about the campaign at otjc.org.uk/ or on twitter @OrgreaveJustice. 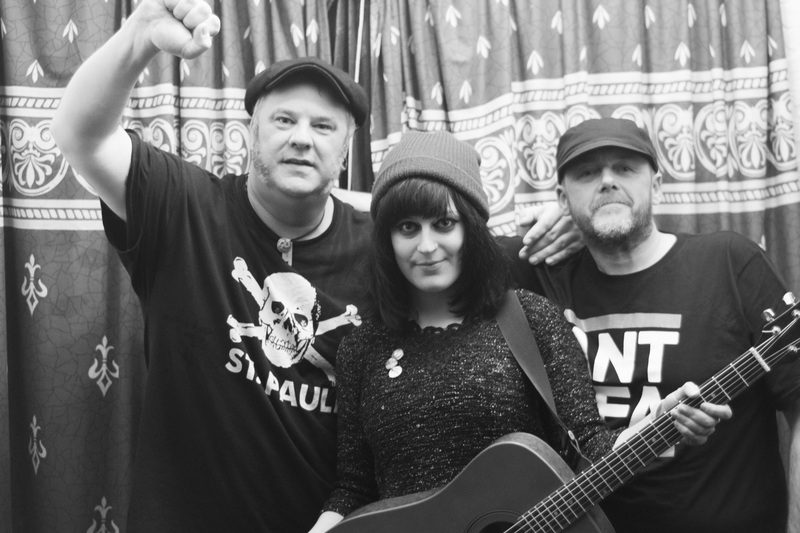 Left to Right; Jethro Platts, Louise Distras and Tony Wright at Barnsley Rock and Blues Venue, December 2014. Photo by Ian Parker. Thanks for the head up and I was proud to take part.